D. and I arrived in Austin a little after lunchtime, so we were quite hungry. After reading about Frank on Chowhound, I thought it would be a perfect place to eat right after we checked into our hotel. Their menu had many types of typical and artisan sausages. I settled on the Jackalope, an antelope and rabbit sausage, served on a fresh bun with huckleberry compote, sriracha aioli, and applewood smoked cheddar. The tart huckleberries were perfect with the gamey and rich sausage. I didn't taste much of the cheddar and the aioli gave everything a nice kick. D. loves waffle fries, so we ordered fries with two dipping sauces: Texas BBQ and Buffalo Bleu. Frank also has a wide beer and cocktail menu... we weren't ready for drinks, even though it was 5 o'clock somewhere. Indeed, a cold beer is man's (and woman's) best friend. I'm a sucker for dachshunds. Although they didn't offer Frankenmuth, they did advertise bacon-infused Maker's Mark. Really? I was rather intrigued. They seemed to have an obsession with putting bacon in everything, so I indulged in an ice cream sandwich. Mexican vanilla ice cream from Amy's Ice Cream, diced bacon, and bacon/chocolate chip/walnut/cranberry/pecan cookies. 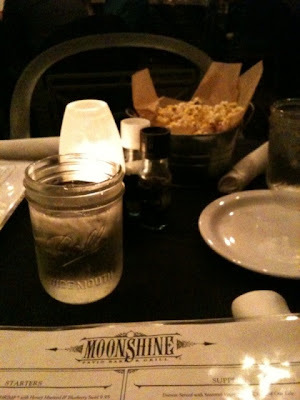 That evening, we headed to Moonshine Patio Bar and Grill. Great-looking building, although we didn't see a lot of it in the rain. Really cozy inside and they had a heated patio, which wasn't a bad place to dine during a rainy evening. Service was excellent, as our server indulged our indecision over the wine with tastings. They were attentive and were very kind when we stayed long past closing, catching up with an old friend. I love the Ball mason jars as drinking glasses, which Frank used, too. Moonshine provides a cute bucket of popcorn instead of bread, which is a great touch. Fabulous service continued when they comped an extra side because D.'s side dish wasn't prepared at the same time as the entree. They brought the original side dish 20 minutes later and he wouldn't have minded the wait, but the comped dish was a really nice touch. My own entree, the pecan-crusted catfish with crawfish tails, homemade hot sauce, and brown-butter sauce, was awesome. 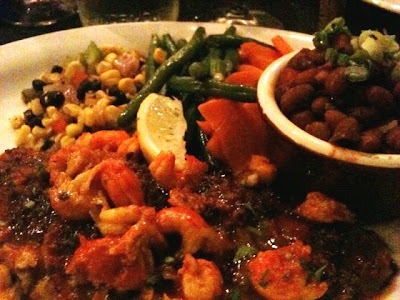 The vegetables on the side were cooked to perfection, especially the succotash. 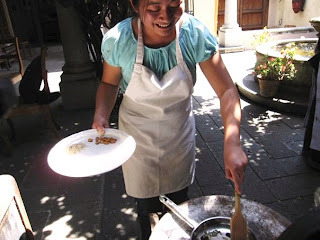 I wasn't a huge fan of my red beans and rice, which was really bland and far too much bean vs. rice. 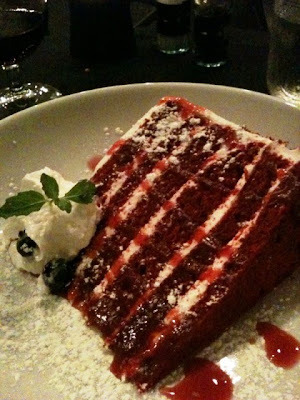 I've had quite the love affair with red velvet cake and this version didn't disappoint. While versions in California typically lean towards a light chocolate flavor, Moonshine's had subtle hints of coconut, with the richness of the buttermilk coming through in the cake. The frosting was a basic buttercream and not heavily used. There was even a mild berry drizzle, which was interesting. It was a fantastic dessert. Red velvet with buttercream sounds right up my alley. I've only had red velvet cake with cream cheese frosting which I think overshadows the cake. Kim- I love cream cheese frosting, but I agree that it can definitely overwhelm the subtle buttermilk-y-ness of red velvet cake. And I love dachshunds, too.